Greenwich Council suggested cutting the frequency of one of the borough’s few north-south bus links to help pay for its plans to pedestrianise Greenwich town centre, according to documents released by Transport for London. The scheme was shelved after objections from Transport for London, and the documents outline TfL’s worries – including its estimate that the scheme could have cost up to £1.5m in maintaining bus services through the town centre area. In response, council consultant Brian Hanson suggested in a briefing on 4 February 2011 that it could cut the frequency of route 286, which runs from Greenwich through Blackheath and Kidbrooke to Eltham and Sidcup – despite the fact that the council has long said north-south public transport links in the borough need to be improved. 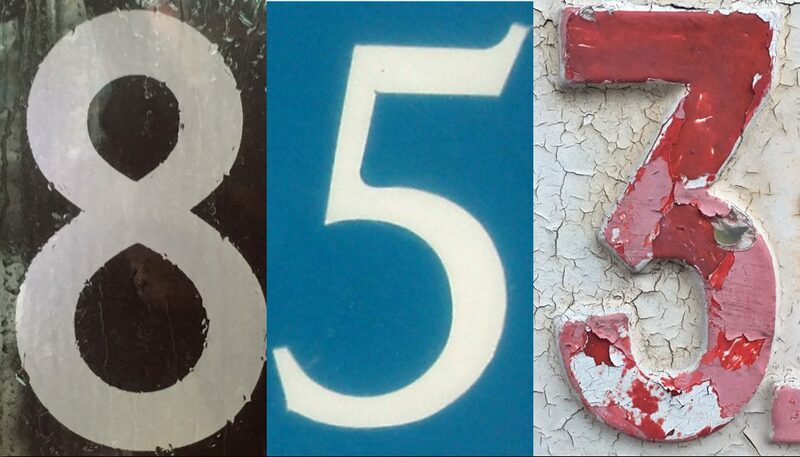 At its most frequent, the 286 runs every 12 minutes, with single-deck buses between Greenwich and Blackheath often packed to capacity at rush hour. It also provides a link to shops at Eltham and the University of Greenwich campus at Avery Hill, as well as Queen Mary’s Hospital at Sidcup, outside of the borough. Hanson also suggested cutting the frequency of the 129, which runs from the town centre, through east Greenwich and on to North Greenwich station. 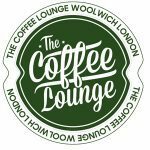 Route 199, which runs from Bellingham to Canada Water station, would not be able to serve Greenwich town centre at all heading northbound, which TfL estimated would cost it up to £713,000 in lost revenue alone. The plans would have seen College Approach and part of King William Walk pedestrianised, and a gyratory system installed running clockwise from Greenwich High Road, Norman Road, Creek Road to Greenwich Church Street. It was proposed to extend routes 129 and 286 to a new terminus at the Norman Road/ Creek Road junction, which TfL said would involve running extra buses. TfL said this alone would cost it £392,000 a year. But Greenwich disputed the cost, with Hyder Consulting‘s Hanson – who is contracted to the council to work on transport schemes – stating “there is sufficient capacity on these routes to reschedule both services to run at a reduced frequency”. “This should be investigated in more detail,” he added. Passengers would have to “accept extra waiting times”, Hanson said in a table outlining how the costs of rerouting routes 129 and 286 could be reduced to nil. The documents also show that Greenwich Council had not yet produced a final business case for the project by the time it was shelved in March, despite initial plans to have a trial scheme up and running by then, with an eye to getting it completed by the Olympics. 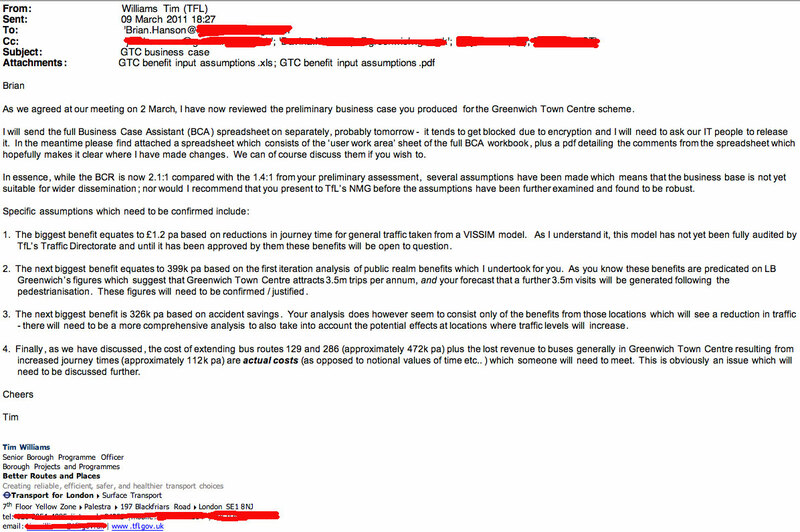 An e-mail from Transport for London’s senior borough programme officer Tim Williams to Brian Hanson dated 9 March warned the council’s assumptions that trips to Greenwich town centre would double following pedestrianisation would need to be justified, and said claims that it would lead to a cut in accidents ignored areas where traffic would increase if the scheme was put in place. He added: “The cost of extending bus routes 129 and 286 plus the lost revenue to buses generally in Greenwich Town Centre resulting from increased journey times are actual costs (as opposed to notional values of time etc…) which someone will need to meet. The scheme was shelved less than three weeks later, delighting residents who had campaigned against the scheme. Hyder has been employed by Greenwich Council to work with it on transport projects including the ill-fated Greenwich scheme. It was also asked by the council’s Eltham Regeneration Agency to conduct a feasibility study into a DLR extension to Eltham, launched in January 2010 and due to report back in May that year. However, the study has yet to appear, and an Eltham route did not appear on a map of proposed DLR extensions unveiled by TfL earlier this month. Greenwich Council has refused to answer how much Hyder is being paid for its work. However, figures published under new transparency regulations state that Hyder Consulting (UK) Ltd was paid £657,147 between December 2010 and March 2011, the most recent figures available.